State Representative Dan Forestal and City County Counselor Blake Johnson, presented the "What About Us" peaceful resistance organizers with a proclamation form the State of Indiana, General Assembly, on July 15th, 2018. The proclamation calls to light the state's recognition of the valuable contributions immigrants make to the state, celebrates immigration family's contributions, and recognizes immigrants for their contributions to "social, political, and economical participation." 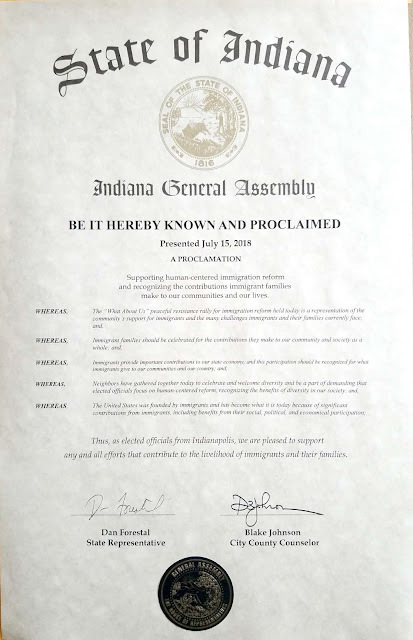 Rep. Forestal and Councilor Johnson, authored the proclamation that recognizes the rally's efforts to "support human-centered reform and recognizing the contributions immigrant families make to our communities and our lives." On behalf the many immigrant families touched by unjust family separations and deportations, organizers of the My Christian Park Neighborhood Association wish to thank State Representative Dan Forestal and Councilman Blake Johnson.